The TOM Drum's 7 internal sounds can be changed by replacing the #I-610 and #I-611 sound ROMs. The internal sounds of the TOM are stored in the socketed #I-610 & #I-611 sound ROMs. 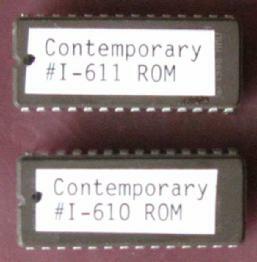 These sound ROMS are located between the Sequential #I-607 Wonder Chip and the #E-40 back-up battery. LATIN PERCUSSION, BASIC PERCUSSION, CONTEMPORARY PERCUSSION, or SPECIAL EFFECTS now available for $29.95 each. LATIN Percussion includes - Conga, Conga Slap, Timbale, Timbale Rim, Agogo Bell, Guiro, Clave. CONTEMPORARY includes electronic sounds - Kick, Snare, Rim, TOM, Lazer, Record Scratch, Splash. SPECIAL EFFECTS includes - Dog Bark, Car Horn, Gunshot, Finger Snaps, Orchestra Tutti, Vocals Grunt, Crowd Roar. The TOM was built with a RAM memory capacity of 2,500 notes, and also has 3 RAM expansion sockets. 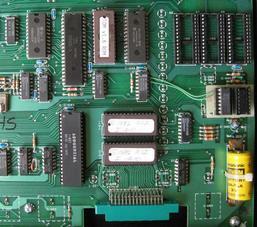 The empty sockets in the picture above are for the memory expansion ICs. Each memory expansion RAM IC installed adds 2,500 notes, and the TOM Drum can store up to 10,000 notes in pattern memory when the RAM is fully expanded. Memory expansion RAM ICs for the TOM are available for $15 each, or 3 RAM ICs for $39.